Welcome to the new Ardrossan Bowls Club site. This site is a one-stop shop for all the information you need about our club. The menu on the left contains links to information about the club, our social activities and info for players. If you’d like to keep in touch on Facebook, click on the Facebook icon in the top-right of this page. If there’s information you’d like to see, please let us know! 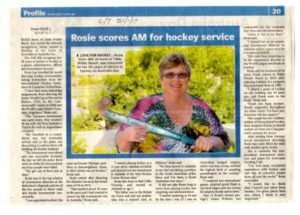 Congratulations to our own Rosie Stern, who was made a Member (AM) in the General Division of the Order of Australia for services to Hockey.